This outdoor museum of wooden architecture is an easy stop for tourists on the road between Moscow and St. Petersburg. One of Russia’s most popular outdoor park-museums of wooden architecture is Vitoslavlitsy, near the medieval city of Novgorod the Great. Located on the main highway between Moscow and St. Petersburg, Novgorod has long been an important destination for those with an interest in Russian history and culture and Vitoslavlitsy adds an additional component of folk culture. Its impressive array of structures ranges from small chapels to large houses whose interiors display period furniture and traditional crafts. The location, set within an old estate with birch and pine groves, is also a delight to the eye. Indeed, Novgorod itself was built primarily of wood until the 20th century, despite its renowned masonry churches and cathedrals dating as far back as the 11th century. The ancient Russian Chronicles contain references to complex churches of wood, such as the first church of St. Sophia in Novgorod (989? ), an oak structure with 13 cupolas. To get to Vitoslavlitsy take one of regular trains from Moscow or St. Petersburg following to Novgorog the Great and then take a bus №7 from the railway station. From extensive archaeological and historical data, it is evident that wood was used for almost every type of structure in Novgorod until well into the 19th century. One of the most important features of Vitoslavlitsy is its array of log churches, including two examples dating back to the 16th century. Indeed, the park can be seen as a textbook on the variety of Russian wooden churches, which were used more carefully than houses and could last for centuries if rotting logs were promptly replaced and the roof maintained. The simplest type of wooden church, such as the Church of the Dormition from the village of Nikulino (1599), resembles a peasant house, with its pitched roof and rectangular components. The plan is linear along an east-west axis, with the main part for worship and another that served as a vestibule. An apse containing the altar projected on the east, and some examples had a bell tower attached on the west to the vestibule. The more elaborate churches of this type, like the larger peasant houses, had carved galleries on raised porches and were decorated with carved end boards that protected the roof beams. Some churches have a roof with two planes above the main structure to better protect the walls from moisture, as in the Church of St. Nicholas at Tukholia (17th century). The most complex examples display multiple gables with decorative carving, such as the Church of St. Nicholas at Miakishevo (latter half of 17th century). Their steeply pitched roofs were designed to shed snow. A second type of log church has a tower structure ascending in a series of octagonal tiers over the main part of the building. In some cases the tower is at the center of a cross plan, while in others the tower is set on the east end of a linear plan, as illustrated by the Church of St. Nicholas at Vysoky Ostrov (1757). When seen from the east, the design suggests the form of a pagoda. The vertical form is most emphasized in the "tent" type of wooden church, so named for the shape of its tall central tower. Here the linear arrangement is replaced by a centralized plan, whose square base is supports an octahedron that is capped with eight-sided tower, as in the Church of the Dormition at Kuritsko (1595). More complex variations of the “tent” tower show a cruciform plan with flanking domes, as illustrated in the Church of the Nativity of the Virgin at Peredki, a monastic structure first mentioned in 1539. The Peredki church (approximately 90 feet in height) has a gallery elevated above the highest snow drifts by a system of projecting logs—a design that shows how seamlessly aesthetics and function were combined in log churches. 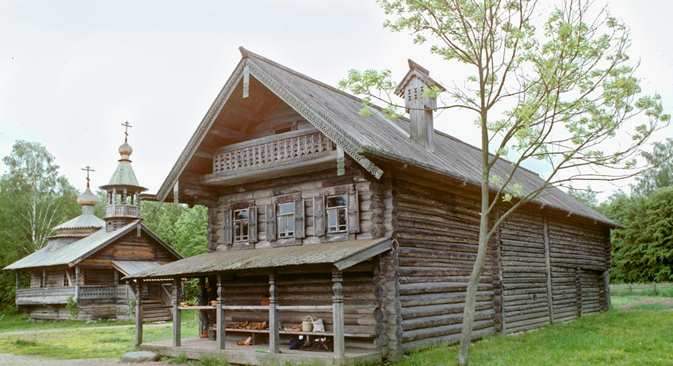 The Vitoslavlitsy park also includes a number of log houses. Although modest in size, these dwellings (known in Russian as izba ) combine artistry of design with economy of function. The center of the peasant log house was the large masonry stove used not only for cooking but also for heating the main living space during the long winters. In the central part of Russia, the house typically formed the main component of a yard enclosed by a solid fence and containing sheds for animals and farm implements. In the more severe climate of the far north, these units were combined into a single, self-sufficient structure. Vitoslavlitsy displays both types. Log houses, whether large or small, traditionally had decorative window surrounds and end boards on the roof. The roofs of log churches show similar ornamental designs, but their windows were left unadorned. Whatever the form, the methods of construction demanded skill and knowledge of the properties of wood. The logs were traditionally cut in late fall after the final ring of the tree – usually pine, with some fir – had hardened, and they were left on the ground until the beginning of building season in late spring. The logs were then taken to the construction site, where they were trimmed, notched, and in some cases planed. Although construction techniques have evolved, wood is still used for houses and churches throughout Russia. The Vitoslavlitsy museum park plays an important role in preserving the roots of these traditions.